You choose the size, we ship two assorted designs. Eloquently simple, soothing men’s silk boxers by Royal Silk® styled in a fabulous design of milk-white pastel stripes. Slip on this dreamy pair of men’s silk boxers and you’ll know why soft, smooth silk feels so luxurious against the human skin. Sleep in them and you will know how comfort can feel so sublime. 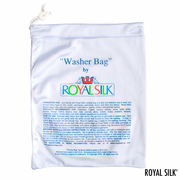 There’s nothing really like the touch and feel of silk and that’s why only silk is silk. Fashioned in light-weight yarn-dyed Madras silk from the south of India. Waist sizes: S (30-32”), M (33-34”), L (35-36”), XL (37-38”), 2XL (39-40”), and 3XL (41-42”). Full cut lengths, 16.5"-17.75" for sizes S-3XL. Inseam about 5.5" for all sizes. Three-panel construction. 100% Silk. Imported. Hand wash or dry clean. Easy wash instructions included. 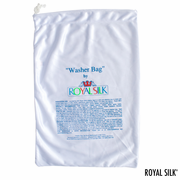 To machine wash, we recommend our Washer Bag for silks, purchased separately, that comes in two sizes. Silk boxers, $39.